The 1st floor consists of a living room with fireplace that leads out to shaded seaview dining balcony; fitted kitchen/dining room, double bedroom, twin bedroom (both leading out to sea-facing balconies) and 2 bathrooms. The ground floor (pool level) has stairs from living room on the 1st floor that lead down to 2nd sitting room and through to a further twin bedroom with en suite bathroom with shower. Both rooms lead directly out to the pool terrace. House On The Rocks can sleep up to 6 people. We have to House on the Rocks a number of times now. For my wife and I itâ€™s probably our all time favourite destination to stay and relax. Fabulous holiday yet again at house on the rocks. Weâ€™ve tried quite a few villas along the coast of this part of Corfu and believe this is the best villa Agni have. This is our 3rd trip here and we hope to come back again. The villa is very well equipped and the view and pool are perfect. Highly recommended. Four of us stayed for 11 nights in June, fabulous villa with a great pool and views. Its very well equipped and has an excellent standard of comfort throughout, especially the beds. The owners are very generous leaving us several gifts of eggs, fruit, etc. throughout our stay. I can thoroughly recommend House on the Rocks, its a great place to stay. Diese Villa verdient mehr als 5 Sterne. Der Komfort, die Sauberkeit und vor allem der Ausblick sind nicht mehr zu Ã¼berbieten. Der Pool ist extrem sauber. Dies war fÃ¼r uns ein perfekter Urlaub. Hier kann man die Seele baumeln lassen. Das Reinigungsteam kam zweimal die Woche, wechselten uns die HandtÃ¼cher und bei Bedarf sogar die BettwÃ¤sche. Waren sehr freundlich und versorgten uns sogar mit frischen Blumen. This villa deserves more than 5 stars. The comfort, the cleanliness and especially the view are unbeatable. The pool is extremely clean. This was a perfect vacation for us. Here you can relax. The cleaning team came twice a week, changed the towels and even the sheets if necessary. Were very friendly and even provided us with fresh flowers. We really enjoyed our stay on the island of Corfu. The view from the terrace is really stunning (imho once in a lifetime). Combined with superb weather (25 degrees and sun) we will remember this as a perfect holiday... We very much enjoyed the fruit at the arrival and sweets and eggs during the mid-week cleaning. Also the fresh flowers on arrival we really liked too! It was just an amazing holiday. We really enjoyed the time in House on the Rocks. We stayed with 6 people and space was more then sufficient. The pool and the view to the sea was that impressive that nobody wanted to leave the house at all. We can just recommend this location and are looking forward to our next stay. Thank you very much for the great time in House on the Rocks Everything was perfect and like illustrated in the brochure if not even better!! Wonderful wonderful wonderful House on the Rocks is really lovely with the most amazing views. Many pretty coves and tavernas along the coast from the house. Hiring a boat was good fun and definitely worth seeing the coastline from a different viewpoint. The house had everything we needed and the cleaning ladies were delightful also thank you for the lovely bottle of wine. Agni Travel are extremely professional and any information concerning the holiday was sent promptly would definitely use the company again. Great house great view great location. Recommend it to anyone. Spotlessly clean villa in a fantastic position. Absolutely amazing views. Beautiful villa and the best we've stayed in. This is a beautiful villa with amazing views. Top floor consists of the kitchen, living room, two bedrooms, two bathrooms. Both bedrooms and living room have balcony access. Downstairs is a large bedroom with en suite as well as an additional living room area. All have French doors leading out to pool area. The house offers plenty of beach towels as well as bath towels and use of a BBQ. There is also rooftop access where one could catch the sun or just sit and enjoy the views. The house was cleaned twice during our week stay, although you do have to supply your own toilet paper, paper towels and of course food. The house is close to shops with the local grocery store offering delivery. There's a path down to the beach on the side of the house but it's overgrown and a little difficult to get down. We were adventurous so we used it, but an easier route is the paved road not far from the entrance to the house. I found the beach very pleasant, not very crowded, not a party scene if that's what your looking for. I would recommend this house to anyone. I can thoroughly recommend the House on the Rocks to anyone. It is a lovely house in a stunning location. At night you can leave the doors open ( with the insect screens down to keep out the mosquito's) and listen to the waves lapping against the shore from your bed. 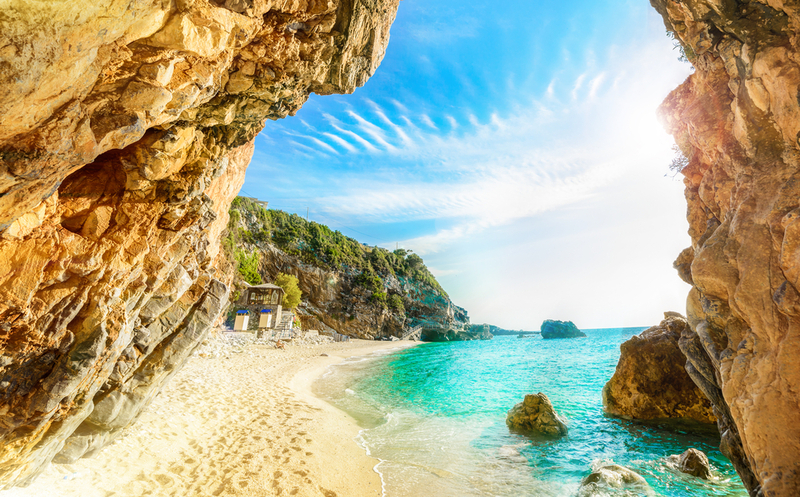 It is certainly located in the most beautiful part of the island that we encountered. It is well equipped and you want for nothing. We met the maid and she was delightful and brought us eggs and wine. All in all a relaxing and enjoyable stay. Beautiful villa in a stunning location. Would definitely use Agni Travel again. This property is excellent, the location is convenient and the views are spectacular. Will definitely be back for another visit. Overall we had a wonderful time in a wonderful location. The hosts were lovely and we could not have asked for anything more. We will certainly be returning to this wonderful island. We had a fantastic stay at House on the Rocks. Magnificent house with superb views. Internally beautiful and well equipped. Very clean pool. A lot of steep steps to get down to the house from car so a challenge for the less able of us and no doubt tricky with strollers.Overall brilliant stay. Thank you. The villa was better then the pictures, very quiet location, the view was breath taking. There is a local shop at the top of the driveway as well as a small bar and the villa is within walking distance to three restaurants. On the second and fourth day we had two cleaners arrive to clean the property who brought with them a bottle of wine and 4 fresh eggs from their farm which we thought was a very lovely touch. Excellent holiday at House on the Rocks - fabulous views across to Corfu Town and Albania from balcony and poolside. Extremely comfortable beds, lovely linens and plentiful supplies of towels. Wifi fast and reliable and compatible with iPads.Very private location as with many Greek villas access it via a steep slope to the car parking area and quite a few steps down into the villa but the view more than makes up for that. Very, very highly recommended villa, definitely on the return list. We had a great holiday. The house was beautiful with all the trimmings. The extra supply of beds and cleaning is well regulated. Already several friends and family given the address itself we also expect to come back highly recommended. The Agni team is also very involved with any services. The House location and service were superb. Agni Travel were flexible with regard to the wishes and supported with any assistance to make it a pleasant stay. Thank you very much for this excellent service. A lovely week with something for everyone. Good walking, swimming, snorkeling and sailing. Great to have a local shop 2 mins away for things such as milk and water. Aphrodites supermarket great. One day we rang to ask if they could put together food for a BBQ. They sent a lovely range and it was not expensive. We were very impressed with the whole holiday and with the arrangements made through Agni Travel. House on the rocks was in a stunning position and a very pleasant place to stay. The furnishings were very nice and everywhere was immaculate. You obviously have a good team so thank you. Absolutely excellent holiday, we have done a lot of villa holidays in various countries and this was by far the best. The small touches made all the difference. It really was a home from home. The location of the villa was also excellent and I hope we can return again soon. We had an amazing week staying at The House On The Rocks. The villa is beautiful, spacious and very well equipped. The views from the balconies are breath taking. 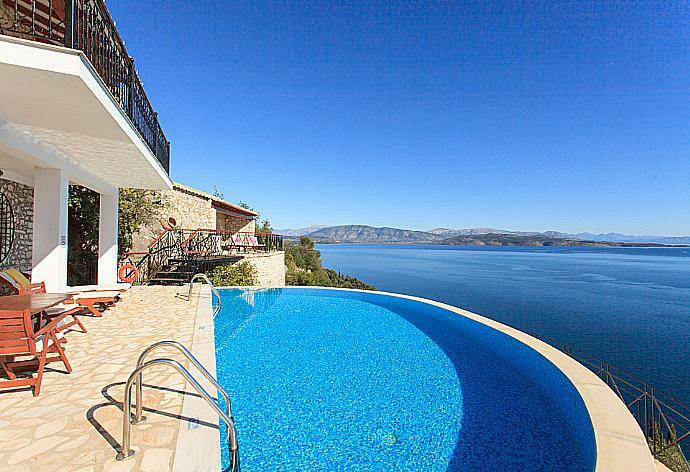 A wonderful property in which to stay while exploring the beautiful island of Corfu.